Il Lido has gone pork-free, but the Italian classics on its menu remain true to their origins, under the skilful hands of a new chef. WHEN Il Lido opened in June last year, it offered an Italian menu with pork dishes, similar to what it had in its fine dining restaurant in Singapore. In July this year, the restaurant decided to go pork-free and went through all the cleansing rituals, before reopening in August with a new menu under new chef Andrea Zanella. 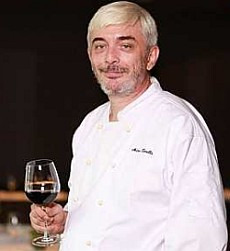 Toast to great food: Executive chef Andrea Zanella serves up a mighty fine spread. So our dinner was mostly about veal, beef, seafood and some almost vegetarian dishes. So think Veal Ossobucco with Saffron Risotto, Ewe’s Milk Ravioli with Truffle and Honey Sauce, Gnocchi with Basil and Garlic Pesto, Zucchini and Pine Nuts. We had heard Zanella is good with veal, and produces some excellent pasta in this restaurant. We also found out that he cooks some great risotto, too. Take, for instance, the Carnaroli Risotto with Crayfish. Carnaroli is risotto rice from Northern Italy, has longer grains that absorb a lot of water and are plumper when cooked. 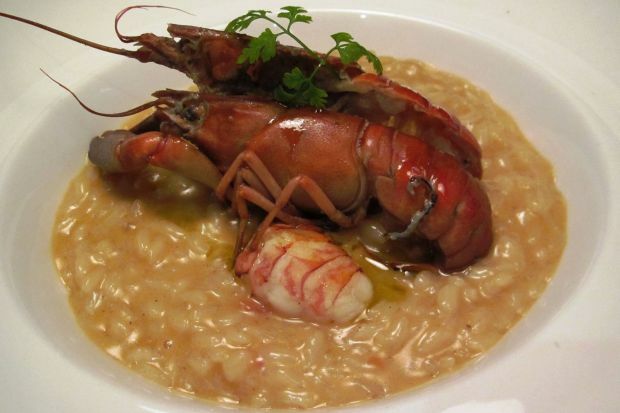 The risotto was good – creamy and smooth, infused with the naturally sweet flavours of the crayfish. This fine dining Italian restaurant, which first opened in Singapore in 2006, is concentrating on Italian classics which are not common in KL. We noticed this as we picked the appetisers – Green Asparagus with Organic Egg and Porcini Mushroom Pesto, Zucchini Flower & Mozzarella Fritter with Vegetable Caponata and Crab Salad with Watermelon and Tomato Elisir. The amuse bouche at the start of dinner was Marinated Kingfish with Arugula, a slice of fish touched with herbs, and left a little raw to preserve its smoothness. The Green Asparagus with Organic Egg and Porcini Mushroom Pesto was unlike anything I had tasted before. A fried egg sat over three asparagus spears, which in turn rested on the mushroom pesto. It was a delicious way to eat vegetables. 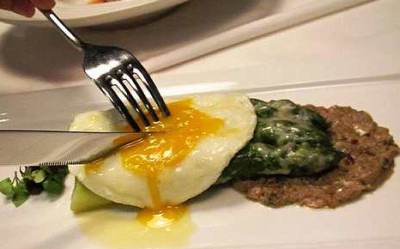 The asparagus was coated with a cheesy sauce, which blended with the egg, and the luscious aromatic porcini pesto. There were all these wonderful textures and flavours that harmonised with one another. I love zucchini flowers and have not had one in a long time. This one had just a little too much batter, and the flower was slightly soggy. Tomato, eggplant and herbs made up the caponata. Fresh, clean flavours emanated from the Crab Salad with Watermelon and Tomato Elisir. The round of sweet crabmeat sat on a thin slice of watermelon bathed in tomato juice. Purple shiso and dill atop the crabmeat added a fragrant dimension to it. Pasta is still considered a starter in an Italian meal. 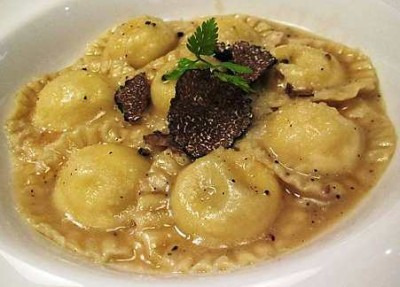 The Ravioli al Miele Tartufato or Ewe’s Milk Ravioli with Truffle-infused Honey and Black Peppercorn is to die for. It’s a signature dish from Sardinia, famed for sheep cheeses and truffle. Here, the chef’s deft hand was evident: the ravioli was al dente; there was the salty, cheesy burst at the bite, contrasting with the fragrant truffle honey. Black truffle shavings and black peppercorns were further enhancements. Angus Beef Short Ribs Braised in Barolo Wine had scrumptious meat with a smoky aroma falling off the bone and into a red wine sauce. It’s to be savoured slowly, with the sublime sauce. Ossobucco con Risotto is the traditional Milanese main course of veal shank braised intensely for a couple of hours with vegetables and wine. Zanella had this deconstructed and presented on a long plate, with the tender boneless meat on one end, the saffron risotto in the middle, and the bone marrow on the other end. So you go from meat to the lovely risotto, and spoon up the bits of marrow from the bone. The meat could have been a little more moist, but all the flavours of the braising sauce were concentrated there. We finished dinner with Lemon Flan with Fresh Strawberries and Vanilla Pannacotta with Red Berries. The lemon flan had slices of strawberry fanning out from beneath. Cut into it and the runny centre oozes out. It had lots of oomph, the tart balanced with the sweet, encased in buttery pastry and topped with sugared lemon zest. It tasted just wonderful. I have had pannacotta at Il Lido before, but this one seemed lighter, but still silky and shivery, covered with a sugar net. It was just the kind of dessert you would want after a heavy dinner. The petit fours that came were Chiacchiere, a type of traditional Italian sweet fritters that were buttery and light, dusted with icing sugar. The fritters were not sweet and were so addictive I couldn’t stop eating them. I had spotted them sitting on a large plate on the counter at the entrance, as I walked into Il Lido, like a bowl of sweets you could help yourself to. The chef’s creativity and versatility is expressed in 40 dishes from all parts of Italy on the new pork-free Il Lido menu. Apart from a la carte items, and the three set menus priced at RM148, RM158 and RM198, there is also a three-course lunch at RM49++ with daily specials from Monday to Friday.